Since the beginning of always-on broadband services, the speed of services has been a constant discussion topic and a central feature of broadband advertising and marketing. The average consumer will usually see one figure, usually prefixed with the words 'up to', but the true quality of a broadband connection can vary significantly from this figure. This guide will help you understand what affects your broadband speeds, how you can test the speed of your broadband connection, and what you can do to improve it. What is affecting my speed? 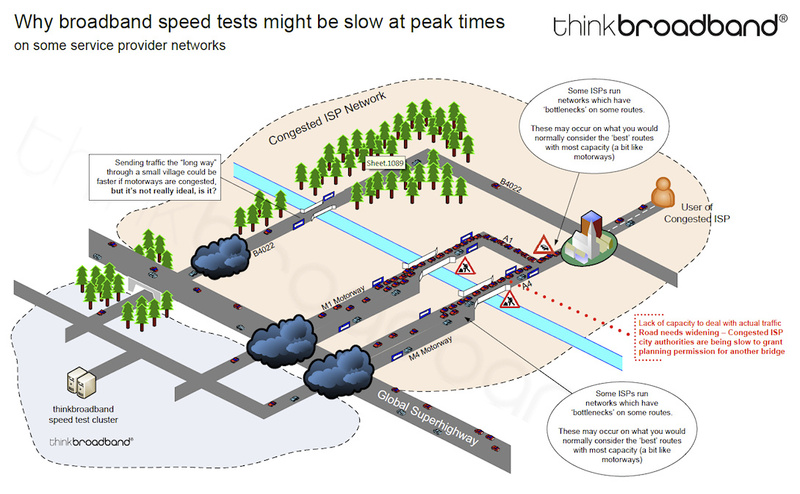 There are a number of different factors which can affect your service speed. Some factors are dependent on the technology used to deliver your connection whilst others affect all types of broadband connections. In this guide, when we talk of 'ADSL', we are referring to a broadband service delivered over your telephone line which terminates on an ADSL modem/router. 'Cable' services refer to those provided by a cable company such as Virgin Media. There are also other types of services (mobile broadband, wireless services, etc.) so this guide may not cover every possibility. Wireless / Wi-Fi—If you are using a 'wireless' connection for your broadband (e.g. your laptop connects to your broadband router using a Wi-Fi connection), the distance from the wireless router/access point can make a difference to the speed you are getting. If you are two metres away from your router, you will likely have a faster connection than if you are 20 meters away. You will also find that walls and ceilings/floors will affect the signal as well, especially in some older buildings. In some circumstances, you might find that being too close to a router (e.g. under 2 metres) and actually reduce speeds so it is worth testing in slightly different locations. The speed of a wireless/Wi-Fi connection will depend on the protocol used; some older protocols (e.g. 802.11b) are much slower than the latest (e.g. 802.11ac) and if you're on a ultrafast broadband connection, the wireless speed can be slower than your broadband connection speed, even if your laptop is right next to the router. It's worth considering using an Ethernet cable connected directly to the router when running a speed test. Wireless interference—Interference from different wireless networks can also reduce your speed, particularly if they are operating on the same channel. If you have a choice of using 2.4GHz or 5GHz wireless, it can be beneficial to use 5GHz if you can receive strong signal everywhere you need it as this band is generally less crowded and the signal does not travel as far, so you should see less interference in this band. If you live in an urban area, it is common to find over 20 wireless networks competing for the same wireless spectrum and it may be worth considering using Ethernet cables if you find the wireless signal poor. Electrical interference—Electrical interference inside your home can affect the speed and stability of your broadband connection. This can commonly cause your ADSL connection to re-sync resulting in both a speed reduction at times, as well as a brief break in service. The cause can be any electrical device (even a neighbour's device) but common causes include boilers switching on. You can minimise the effects of this by ensuring that you use high quality telephone extension cabling, or disconnecting extensions altogether at the master socket. Microfilters—ADSL broadband services require you to fit a 'microfilter' to every device which attaches to a phone line (or in some cases you may have a 'faceplate filter' on the master socket which filters all extensions). This means phones, faxes, answering machines, Sky+ boxes and anything else with a connection to the phone line. If you forget to install a microfilter on each extension, you are likely to have significant problems with your broadband connection, although it may work fine at times. A faulty microfilter may exhibit the same effects as a microfilter not being present so it can be worth disconnecting all other devices and extensions if you are diagnosing a problem. Speed of your computer—Some older computers will struggle to keep up with modern superfast broadband connections; this may be due to the age of the computer, or due to the amount of software installed. You may be able to upgrade the computer or remove unused software. Consult your local IT support service for advice. Other users in the household—If you share your broadband with other users in the household, your bandwidth (the speed available) will also be shared across all the users. Contention—Broadband networks are 'contended' networks a bit like the road network—this means that there isn't enough capacity for every user to use the service at full capacity, at the same time. This contention helps to ensure prices remain low as generally speaking demand varies. However at peak times, you may find your broadband slows down. Remember that 'peak' in broadband terms can be in the evening, although this may vary by where you live and who your broadband provider is. Also, it's more likely you will see congestion during major events; during the World Cup, there was noticeable congestion on broadband networks. Congestion—If there are lots of people using the Internet in your area at peak times, it may slow your speed down. This is most likely to be visible in small communities where the link from the telephone exchange back to the service provider is likely to be smaller. How near you live to your local exchange will affect the speed of your broadband. 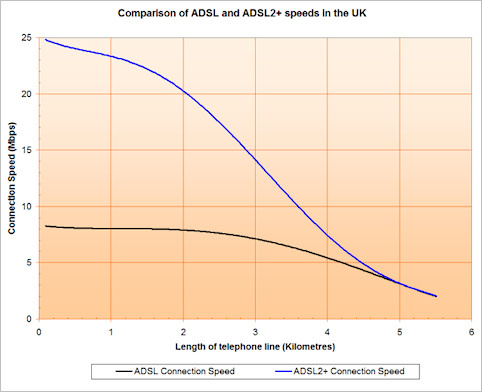 If you have fibre broadband, your speed shouldn't be as affected by line length. The Internet is made up of tens of thousands of separate networks; your provider is one of them. When you visit a website hosted on another network, there are a number of possible paths for your traffic to take and sometimes, some of these paths can become congested. This type of congestion can mean that at times, some websites will appear slow whilst others may be working just fine. It can be caused by your ISP congesting some of their peering links to other networks, or even inside other networks (e.g. those hosting the website you're having difficulty accessing). This is not a reflection on your broadband speed, but something to think about if you are experiencing problems. The term 'traffic shaping' or 'traffic management' refers to technology used by providers to control the amount of bandwidth (i.e. speed) available to a particular user, device, application or website. These are commonly used to restrict high volume transfers, either by restricting bandwidth available to the most heaviest users at peak times, or by slowing down certain types of services such as peer-to-peer (p2p) file sharing. Some types of traffic are less sensitive to speed variations. If you are downloading an operating system update or sending an e-mail, then a delay of a couple of minutes is unlikely to affect your user experience very much. However, if you are watching a live broadcast/television stream, listening to a radio station or having a video chat with someone, an interruption/slow-down can have a noticeable effect. Broadband providers use traffic management technology to sometimes prioritise these applications, to help you get a better experience without requiring additional investment in capacity which would in turn require them to charge more for their broadband service. Since the beginning of April 2012, the Advertising Standards Authority has adopted a policy which states that where a provider states a numerical speed claim in their marketing communications (i.e. in advertising, on the website, etc. ), they should "be able to demonstrate that the speed is achievable for at least 10% of the relevant customer base". This means that if you see an 'up to 14 meg' broadband service, you would expect at least 1 in 10 users to be able to receive 14Mbps. A broadband speed test is a useful tool which you can use to measure the download and upload speed of your broadband connection. It works by measuring the time it takes to download a certain amount of information, and then carrying out the same test in the upstream direction. The measurement is then provided to you along with other information about the quality of your connection. Our speed test is used by various websites including the Gadget Show because of its reliability, accuracy and our capability to cope with scale. Our speed testing platform has been built from the ground up by our staff for over ten years and uniquely, it runs on a network we control so we can monitor its performance and ensure there are not bottlenecks caused by our end of the connection. Many other speed tests run on shared servers on third party networks, or even on many different networks so the results can vary depending on which server you use. Our test servers are based on dedicated hardware with direct 1Gbps connection to our core network. The results you receive may vary from one test to the next as the performance of your connection will not always be the same. Please refer to the things affecting my broadband speed section above for more details, and remember the speed test is between your computer and our servers, so make sure it's not affected by anything under your control. I've done the speed test, what does it mean? A fast download speed means information will come to you quickly. This means that for example, when you download a music album, it will finish sooner than if you were on a slow connection. A fast upload speed means it's quicker to send information, such as uploading photos or videos to a website. Broadband speeds are usually measured in "Megabits per second", "Mbps" or "Mb/s" although this is often (incorrectly strictly speaking) referred to as 'meg' or "Mb". Sometimes you may see speeds in "Kbps" or "Kb/s" which refers to "Kilobits per second". There are 1,000 Kbps in 1 Mbps. Typical broadband download speeds range from a few Mbps through to 100 Mbps for a superfast broadband service whilst upload speeds range from 250 Kbps (0.25 Mbps) to around 5 Mbps on the superfast services. Check the speed your ISP advised you'd be able to get when you signed up. If you're not getting the speed you're paying for, then consider a different provider, but do remember that many of the factors affecting speed may be the same (e.g. your computer, your wireless network at home, the quality of your phone line, etc.) You should raise your concerns with your current broadband provider in the first instance. Why is my download speed faster than my upload speed? Since the start of broadband services, download speeds have generally been several times faster than upload speeds. This is called an 'asymmetric' service and it's also the first word in the 'ADSL' acronym. The reason is primarily that with limited bandwidth available, the protocols used have been developed to maximise download speeds as more content is consumed from the Internet than is uploaded to the Internet. There are some technologies such as ADSL2+ Annex-M which increase the upload speeds, but at a cost of slower download speeds. Also, broadband providers can use this imbalance to provide hosting services (which typically use the upload segment) and share some of the cost of running a network between different types of users. Why is your speed test slower/faster than ... ? There are a number of differences between our speed test and most others on the Internet. It's worth noting that most other tests run in a similar way, so the fact our tester gives you a different result to many others doesn't mean there's anything wrong with our test. Network—our speed test runs on a network we control giving us the ability to ensure nothing on our end is causing any problems. Some providers run more congested interlinks to the main London peering points such as LONAP and LINX (to which we connect), in which case traffic to us might be affected. The routes to other testers may be different, so they might not be affected in the same way. All our tests run from dedicated servers on our network so we can vouch for our end of the test. Some other testers may pick from a number of servers to pick the fastest ones–We don't believe this is a fair way to measure speed as you get the best result which may not match your true experience when using the Internet. Traffic shaping—While our speed test uses the HTTP protocol for the data transfer which some providers may traffic manage there is an option to run the test over SSL which will use encryption on the data transfer. For those on ultrafast broadband connections the extra work of running a fast SSL link may tax some slower computers and mobile devices. Software—our speed test is available in a format that works across the majority of devices that have a web browser built-in. Many other speed tests are available in Flash only or require installation of apps on mobile devices. Sometimes the speed of your computer or the version of your web browser/Flash can cause problems, so if running a speed test on a very old PC or phone you may not get the best speeds. Threading—our speed test can run in a variety of modes the default configuration runs several downloads at once to ensure that we can get as close to your connection speed as possible. Our servers are more than capable of delivering full speeds for broadband connections on a single thread and we will sometimes run both multiple thread and single tests using your connection. A single thread download test is more sensitive to variations in your Wi-Fi speed or congestion on your providers network, you run force the running of this sensitive test with this special speed test version. You can also run single thread or multi-threaded tests on our download test files. Compression—we send random data which has been pre-compressed so that the test reflects the true speed of your connection. Sometimes, it's possible to compress data further and therefore the apparent speed would be faster and some routers and anti-virus software use large software buffers that can give burst speeds above your actual connection speed. Measurement—we measure the mean average speed of the connection by taking the amount of data transferred and dividing it by the time. Many other testers will measure speed in intervals and show you either the fastest measurement, or a percentile. This means in practice that you could disconnect your broadband service during the test for a few seconds, and then reconnect it, and still get a fast result on some other tests! (yes, we've tried it!). We don't think this is a fair way to represent speed without informing the user. IPv6—our speed test has been IPv6-compatible for many years and if we detect support for IPv6 when you run a test we will automatically use IPv6. If you have IPv6, you may find routing is a bit different so this can cause a difference. We also have an IPv6 readiness test to check if your broadband is IPv6 enabled. Bandwidth Meter (tbbMeter)—this is a tool for Windows PCs which allows you to monitor the bandwidth usage of all applications on your computer. It's useful to see when your computer is downloading or uploading to/from the Internet when you're not expecting it. It will also let you track how much data you use each month. It can also do a multi-threaded download from our servers to test speed. Download Test Files —these are files fill of random data which has been pre-compressed and available for you to download over various ports. Why is the connection speed different to my download speed? It is normal for the connection speed (sometimes called sync speed) to be be different to the download speed (or upload speed) that you are seeing on your devices. This is generally because the data you are sending and receiving from your devices is wrapped up in an additional layer for sending across the broadband networks, so for VDSL (FTTC) services for example this overhead means if you actually connect at 79,999 Kbps the maximum download speed you can expect is 76 Mbps, as a general rule the maximum download speed you will see is 96% of the connection on the fibre to the cabinet services. This overhead is higher on the BT Wholesale ADSL2+ services with around a 10% loss, due to the overheads and IP profile system, on the LLU ADSL2+ services the overheads still mean a similar loss. This difference means it is very important when buying broadband to understand if an estimate or guarantee is talking about the download speed you will see on an ideal device you connect to your modem/router or whether they are talking about the connection speed, for example a service based on the Openreach 55/10 FTTC service will give in perfect conditions a download speed of 52 Mbps and an upload speed of 9.5 Mbps. For those with DOCSIS cable broadband the connection speed is fixed based on the product speed you buy and they over provision, e.g. a 200 Mbps service may actuall connect at 220 Mbps meaning that even with overheads it is possible to record in perfect conditions speeds marginally faster than what you paid for. While its possible to get the best speeds over a Wi-Fi connection the extra overheads of carrying your traffic over Wi-Fi generally mean that connecting via an Ethernet cable will give a better result and also be a lot less variable. My provider gives a speed guarantee which they say I am getting but speed tests suggest otherwise! The key is the exact wording of the guarantee since many are just guarantee the connection speed rather than the speed you will see on your computer, tablet or mobile phone. For many providers the guarantee is based on a percentile figure derived from the range of speeds expected at your property, and these estimates can be wrong, therefore some investigation to see what neighbours are getting and confirming the connection speed of your modem is important. Some providers have portals that show the connection speed over time, but otherwise best to ask for help on our forums where the group expertise will be able to help you. For ADSL2+ and FTTC (Fibre to the Cabinet/VDSL2) services you also need to ensure that the telephone wiring in your property is not the cause for a low connection speed. Most consumer broadband speed guarantees do not include the impact of what others are doing in your area/town/region so at peak times while the connection speed should not vary you may see download speeds varying and while a small 5 to 10% is acceptable, if your speeds are dropping by 90% on a regular basis then clearly you should be able to pester your provider irrespective of any explicit guarantee they state. My provider says they won't slow me down, but I see download speeds varying, why? When providers say things like they don't slow you down what they mean usually is there is no traffic management, but your speeds for downloading and uploading data can still be impacted on what the other thousands and millions of customers are doing on their own connections, and the issue is not the broadband itself usually but the point where all the connections are aggregated to share access to the wider Internet or caches for playing back video streams. 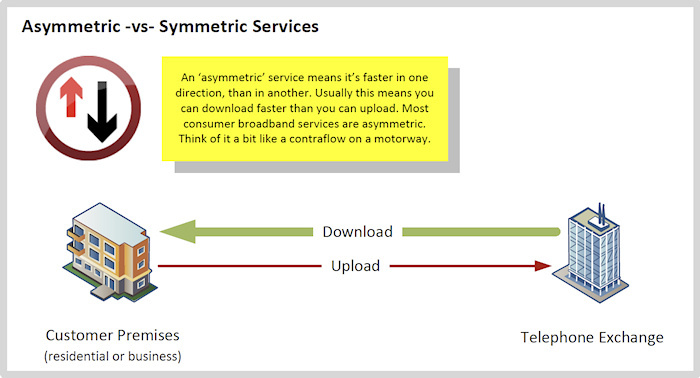 Consumer broadband is based around the idea that not everyone will want to use all their bandwidth at the same time, the best providers manage to manage this so that the dips in speed are almost invisible, but with some the variations may be significant.